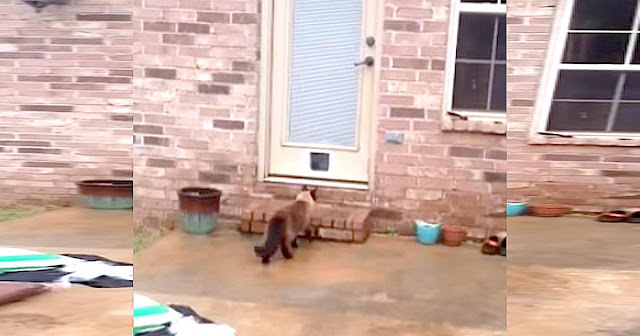 Home › videos › Dad Spent 2 Hours Building A Door For His Cat. Now Watch How His Cat Reacts! Dad Spent 2 Hours Building A Door For His Cat. Now Watch How His Cat Reacts! While most cats like to meow or scratch when they want to come inside the house, Philo the Cat is very different. In fact, he acts more human than feline. Recently, Philo’s owner, Brian, spent two hours building a new cat door for Philo. This way he can come in and go out as he pleases without needing Brian there to help him. When the cat door is finally installed, Brian takes out a camera and starts filming, hoping to capture his kitty’s reaction to the door on camera. “Try out your new door,” Dad says. Philo wanders up towards the front door, but he’s hesitant about what to do. He even looks back to the camera and few times to make sure everything is alright. As Dad encourages his cat more and more, Philo nears the door, but just when you think he’s about to enter, Philo does something unexpected. What he does is hilarious, so I do not want to spoil it. Be sure to watch the vide to find out!